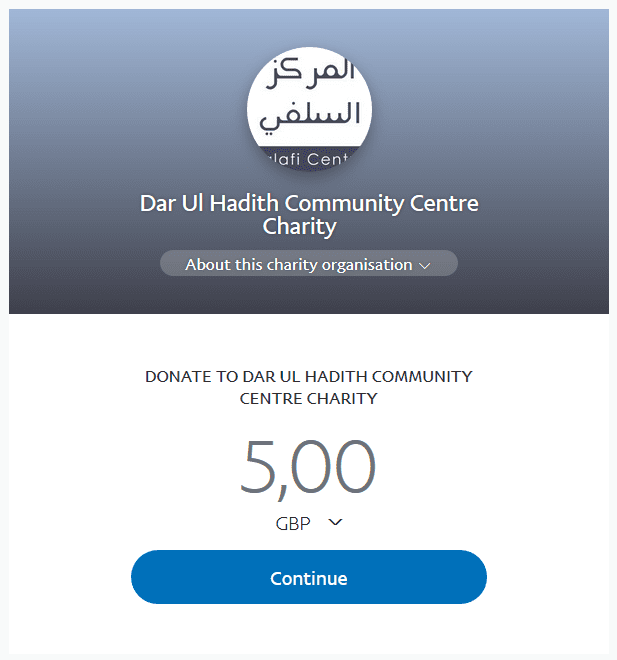 Facts about Abu Talhah (rahimahullaah) – A man who defended the Sunnah! FACT: Abu Talhah translated Shaikh Muqbils’ refutation on Abdullaah as-Sabt of Ihyaa Turaath in 1997. FACT: Abu Talhah translated Shaikh Muqbil’s refutations on Suhaib Hasan and al-Hidaayah in 1997.FACT: Abu Talhah translated Shaikh Rabee’s first critique of Suhaib Hasan and Turaath in 1997 after Hajj. FACT: Abu Talhah translated sections from Shaikh Rabee’s ‘Jamaa’ah Waahidah Laa Jama’aat’ in refutation of the head of Ihyaa Turaath, Abdur-Rahmaan Abdul-Khaaliq in 1998. FACT: Abu Talhah translated portions of Shaikh Abdus-Salaam Burjis’s ‘Mu’amalaat al-Hukaam’ in refutation of the Qutubees and those who called for revolt and revolution in the mid to late 1990′s. FACT: Abu Talhah prevented any amalgamation with Muhammad Suroor after he had read ‘as-Sunnah’ magazine of this takfeeree in the early nineties, and found it to be in contradiction to the Sunnah! FACT: Abu Talhah translated portions of the book ‘al-Qutubiyyah’ in refutation of the Qutubees such as Safar al-Hawaalee and Salmaan al-Awdah who were attacking the major scholars. FACT: Abu Talhah translated the fatwa of Shaikh Ibn Baaz (rahimahullaah) calling the authorities to prevent Safar and Salmaan from delivering lectures, classes and their tapes from being distributed. FACT: Abu Talhah translated many of Shaikh Rabee’s refutations against Syed Qutub and al-Mawdoodee; ‘Manhaj al-Anbiyah’ is point and case. FACT: Abu Talhah translated Shaikh al-Albaanee’s refutations on Ihyaa Turaath and Abdur-Rahmaan Abdul-Khaaliq. This was part of Ustaadh Abu Talhah’s methodology, which he learnt from the Ulama of Salafiyyah, and this is the same methodology he died upon (rahimahullaah). The Imaam of Jarh Wat-Tadeel in our era Al-Allaamah Rabee Bin Haadee and others are witnesses to this fact. *Ustaadh Abu Talhah (rahimahullaah) was neither upon the methodology of the Qutubiyyah and Surooriyyah nor that of the Haddaadiyyah. *Ustaadh Abu Talhah (rahimahullaah) was neither upon the methodology of Al-Maghraawi nor that of Al-Maribi, Halabi and Al-Hajoori. *Ustaadh Abu Talhah (rahimahullaah) was not upon the erroneous views of Bilaal Philips, Abu Muslimah, Abu Usaamah, Shadeed Muhammad, Ali Tameemi, Zaraboozo and others. *Ustaadh Abu Talhah (rahimahullaah) was neither upon the innovations of Ikhwaan al-Muslimeen and Hasan al-Banna nor that of Jamaat At-Tableegh and Muhammad Ilyaas. *Ustaadh Abu Talhah (rahimahullaah) neither rejected the Jarh Mufassar of the scholars in order to defend figureheads and personalities of bidah nor spoke with Al-Muwaazanah to accommodate the groups, sects and figureheads of Bidah. *Ustaadh Abu Talhah (rahimahullaah) neither brought doubts in the narrations of the trustworthy narrators nor did he differentiate between Aqeedah and Manhaj in order to destroy the clear boundaries between the Salafi Methodology and the false methodologies. *Ustaadh Abu Talhah (rahimahullaah) neither called to political parties nor the evil and false view that the Salaf differed in Aqeedah—an ignorant view of Aasim Al-Hakeem the Pseudo Shaikh. 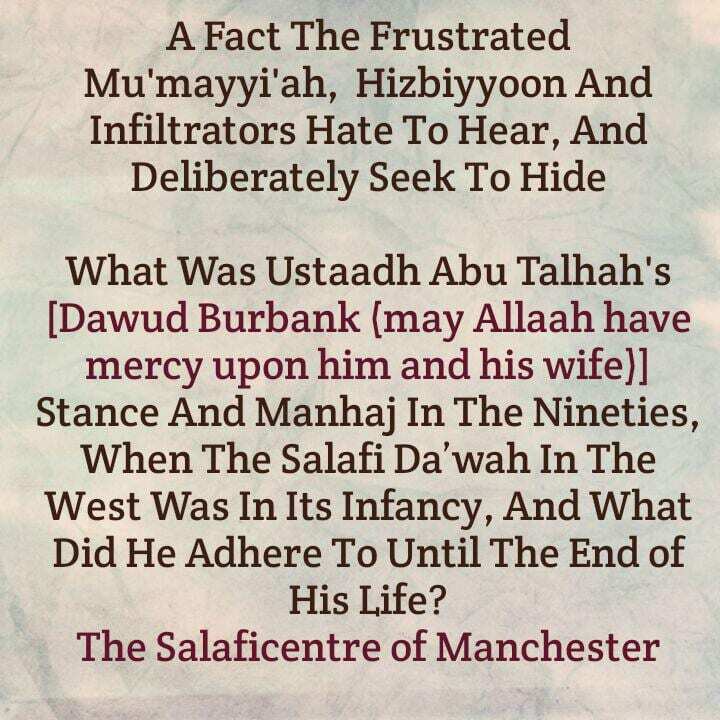 *Ustaadh Abu Talhah neither reviled the scholars of Ahlus Sunnah in this time and make the people flee from them nor did he defend those who call the Sahaabah Ghuthaa-iyyah. *Ustaadh Abu Talhah (rahimahullaah) neither called the people to accept the misguided sects, parties and organizations into the domain of Ahlus Sunnah nor did he call to the unity of religions. *Ustaadh Abu Talhah (rahimahullaah) never defended the principles that are now been propagated by likes of Ibraaheem Ruhayli. *Ustaadh Abu Talhah applied Imtihaan by way of the Ulama of the Sunnah in this era, such as the likes of Shaikh Bin Baaz, Shaikh Uthaymeen, Shaikh Albaani, Shaikh Fawzaan, Shaikh Rabee, Shaikh Ubaid, Shaikh Muqbil and others. So, whoever spoke well of them, loved them and followed what they stated with Daleel, Abu Talhah was pleased with him. And whoever spoke ill of them, then Abu Talhah was distant from them. May Allaah have mercy upon all of us, the scholars and students of knowledge Aameen.